David Bell has been sacked as manager of Corby Town. The Steelmen confirmed he has left Steel Park along with assistants Rob Gould and Kevin Ward following a dreadful start to the Evo-Stik League South season. Academy director Steve Kinniburgh, who took charge of the team at the end of the last campaign following the departure of Gary Mills, has been placed at the helm again for tomorrow’s clash with Stocksbridge Park Steels. Appointed over the summer, Bell has paid the price for a poor start to the new season. The Steelmen have won just two of their 13 matches in all competitions and have failed to keep a single clean sheet in that space of time while attendances at Steel Park have dwindled. They had started the season with a 5-1 victory over Romulus but, since then, they have suffered six league defeats while also exiting the FA Cup, the Integro League Cup and the NFA Hillier Senior Cup at the first hurdles. 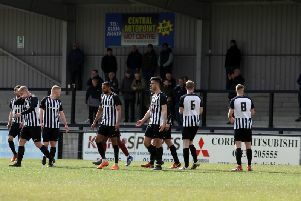 Corby, who have already suffered two successive relegations, will start tomorrow’s home clash sitting in 19th position in the league table. The club will not be making any further comment for the time being but said in a statement: “Steve Kinniburgh will take charge of the team tomorrow against Stocksbridge Park Steels. “The club will be making a further announcement in due course.